Sculpture is three-dimensional artwork created by shaping or combining hard and or plastic material, sound, and or text and or light, commonly stone (either rock or marble), metal, glass, or wood. Some sculptures are created directly by finding or carving; others are assembled, built up and fired, welded, molded, or cast. Sculptures are often painted. A person who creates sculptures is called a sculptor. 1.Free-standing sculpture, sculpture that is surrounded on all sides, except the base, by space. It is also known as sculpture "in the round", and is meant to be viewed from any angle. Sculptors have generally sought to produce works of art that are as permanent as possible, working in durable and frequently expensive materials such as bronze and stone: marble, limestone, porphyry, and granite. More rarely, precious materials such as gold, silver, jade, and ivory were used for chryselephantine works. More common and less expensive materials were used for sculpture for wider consumption, including glass, hardwoods (such as oak,box/boxwood, and lime/linden); terra cotta and other ceramics, and cast metals such as pewter and zinc (spelter). Sculptures are often painted, but commonly loose their paint to time, or restorers. Many different painting techniques have been used in making sculpture, including tempera, [oil painting], gilding, house paint, aerosol, enamel and sandblasting. 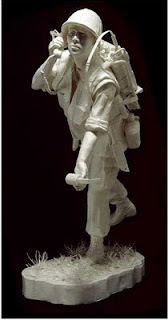 Many sculptors seek new ways and materials to make art. Jim Gary used stained glass and automobile parts, tools, machine parts, and hardware. One of Pablo Picasso's most famous sculptures included bicycle parts. Alexander Calder and other modernists made spectacular use of painted steel. Since the 1960s, acrylics and other plastics have been used as well. Andy Goldsworthy makes his unusually ephemeral sculptures from almost entirely natural materials in natural settings. Some sculpture, such as ice sculpture, sand sculpture, and gas sculpture, is deliberately short-lived. Sculptors often build small preliminary works called maquettes of ephemeral materials such as plaster of Paris, wax, clay, or plasticine, as Alfred Gilbert did for 'Eros' at Piccadilly Circus, London. In Retroarchaeology, these materials are generally the end product. Sculptors sometimes use found objects. Kebetulan aku pun baru snap one sculpture..
nice blog u guys have.. i just learn about blogging.. do teach me!